Tax season is upon us already, with new rules, exemptions, and limits for your 2017 return. Even if you have been a tax return ninja all your working life, the ‘over 65’ tax return presents different challenges than the ones you know. Caregivers and loved ones who are tackling the ‘senior’ return for the first time should know that there are some limits, conditions and exceptions that apply only to those over 65. 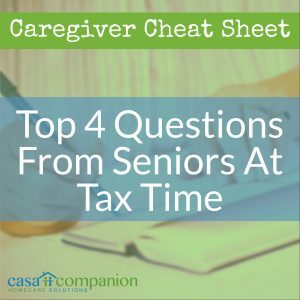 You should always consult a tax professional for legitimate tax advice, of course, but here are the answers to the top 4 questions caregivers and seniors have about tax year 2017. Question #1: Do I Really Need to File A Return? Take it straight from Intuit’s mouth: “The IRS requires you to file a tax return when your gross income exceeds the sum of the standard deduction for your filing status plus one exemption amount. These filing rules still apply to senior citizens who are living on Social Security benefits. If you are a senior, however, you don’t count your Social Security income as gross income. If Social Security is your sole source of income, then you don’t need to file a tax return.” Naturally, exceptions abound. If you have income from sources that aren’t Social Security benefits, or aren’t tax-exempt, then you may need to pay taxes. But don’t take our advice – please! – because the IRS wants to help you figure out what part of your income may be taxable. Forms 1040 and 1040 both contain a Social Security benefits worksheet with instructions. Publication 915 spends 32 pages going through every possible scenario – plus worksheets! Question #2: To Itemize or Not To Itemize? If you have unreimbursed medical and dental expenses you want to deduct on your return, the rule for 2017 is that these expenses must total at least 10% of your income before you are eligible to itemize. It’s possible the IRS doesn’t want to deal with your box of crumpled, unsorted receipts, either. So the standard deduction increased for everyone in 2017, and if you are a senior, your standard deduction is even higher. Single or head-of-household seniors can add $1550 and married, joint-filers can add $1250 to the standard deductions. Itemize if you should but know that there’s an incentive to taking the standard and keeping your receipts at home. Question #3: Can I Get A Tax Credit Over Here?! There is a tax credit for seniors, if you file a return and if you owe money. If you are 65 or over, and your Adjusted Gross Income, and your income from non-Social-Security-benefits, non-tax-exempt sources, don’t exceed the limits for each filing status, you’re eligible for a credit. The website The Balance has a great explanation of these limits for tax year 2017. 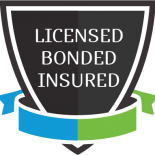 If your income does fall within the appropriate window, you can take $3750 to $7500 off the amount you owe for 2017. Unfortunately, the credit doesn’t carry over, so if you’re eligible for more than you owe for 2017, you don’t get to use it against 2018. Question #4: Can Anyone Rid Me Of This Troublesome Paperwork? Did you know that the IRS offers free Tax Return Preparation? Seniors and low- to moderate-income people who cannot prepare their own tax returns can use an IRS-sponsored volunteer tax assistance program which offers free tax help. Per the IRS website, “the Tax Counseling for the Elderly (TCE) program offers free tax help for all taxpayers, particularly those who are 60 years of age and older, specializing in questions about pensions and retirement-related issues unique to seniors. The IRS-certified volunteers who provide tax counseling are often retired individuals associated with non-profit organizations that receive grants from the IRS.” Check out Publication 3676-B for what they can do to help, what they can’t help you do, and what you need to bring with you. Find TCE locations here – we found 19 results within 25 miles of Mission Valley! Everyone’s tax situation is different, so caregivers, home care aides and loved ones may all have different tax situations from one another. The best way to make sure that your tax return is the best it can be is to find help: from professionals or from volunteers who have the IRS seal of approval. Tax Day is April 17, 2018, so it’s time to get ready and get answers!